The Pyrenees Mountains are world renowned for being home to all things snow. This amazing mountain range which rises up to separate France from Spain has some of the best skiing to be found in Europe. The Pyrenees has long been a choice for those looking for a more family orientated skiing trip as well as anyone wanting to make the most of the more down to earth and holiday feeling that the French Pyrenees, in particular, can offer. But there is more to the Pyrenees than just the French and the Spanish parts. Hidden in and amongst the taller peaks of the Pyrenees lies the hidden gem, Andorra. Andorra is a small country that sits between Spain and France in the middle of the mountain range. Although it is truly tiny (only 467.6 k km2), what it lacks in size it happily makes up for in high altitude and well-equipped ski-resorts. Not to mention one of the largest ski resort in the Pyrenees, Grandvalira. But what is so special about Andorra I hear you ask. Well, firstly what sets skiing in Andorra apart from most other ski locations is the trip itself. Most other ski locations are perfect for skiing but not much else; this is not the case here. To get to Andorra you can fly to either Barcelona or Toulouse, both of which are beautiful cities where you could spend a day or two seeing the sights before heading on to Andorra. Andorra itself is also a great place to spend time when you are not skiing as its historic past means a wealth of old buildings to visit. It is, of course, the skiing though which makes Andorra stand out amongst the other great ski locations in the Pyrenees. Andorra offers over 300 kilometers of slopes and has something for absolutely every level of ability. Here you can choose to ski on the many groomed slopes or find your own spot to freeride. Home to one of the largest skiable area in Europe, this tiny country can be relied upon to some of the best snow in the area as well as a vast selection of terrain types. While the rest of the Pyrenees has seemingly leaned towards the more upmarket mega-resort side of things, Andorra remains that little bit more humble in its approach. In Andorra ski resort there seems to be a slightly warmer and more welcoming atmosphere, compared to what you may encounter many other places. Adding to this treat, there is much more reasonably priced accommodation for skiers visiting Andorra- albeit not as picturesque in parts as the French equivalent. All these reasons and more are behind the rise in popularity of what is fast becoming the ‘Best skiing holiday that you never knew about’. 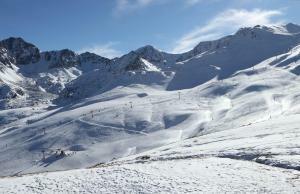 So now that you know about this ‘hidden gem’ amongst the Pyrenees peaks, where should you ski? Well, there are various choices within this small area, and all of them are high altitude and fairly well-equipped. A great place to start would be with the biggest ski resort in Adorra, Grandvalira. Grandvalira easily has to be one of the best choices when skiing in Andorra. The resort was opened back in 2003 and was the product of two of the oldest ski resorts in the region joining together. When Pas de la Casa-Grau-Roig which was opened in 1956 joined together with Soldeu-El itself having opened in 1964, the result was one ski resort stretched over two whole provinces. This resort now boasts a full 210 kilometers of skiable runs which are split between nearly 130 slopes for skiers of all abilities. This super-sized resort is after much investment in skiable areas and ski lifts now able to handle upwards of 100,000 skiers per hour. And the consistent and steady level of investment has meant that it has been able to host some of the skiing calendars most prestigious competitions. The Women’s Skiing World Cup as well as the trials for the Speed Skiing World Cup both take place at Grandvalira. Now that one of Europe’s largest ski resorts has set its sights on summer tourism, Grandvalira has added a number of new attractions to its already full list. You can now take your children there and enjoy the ‘Mont Magic’ experience which is an entire skiable area specially designed for younger skiers. The new golf course at Soldeu or ‘Soldeu Golf’ as it is known is a great place to spend the day and for those who want to get off the beaten track the new 4x4 routes from the Funicamp. Grandvalira is made up of six different areas and includes not only a massive amount of skiable space but also affordable lodgings and fun for all ages. The resort is home to a good number of bars and restaurants too, which are reasonably priced. When it comes to après-ski this place has various options to choose from. You can enjoy the view from Col Blanc which sits right at the summit of the mountain or ski to the bottom and find Olympiades. The prices at most of the resorts' restaurants, "factor-in" Andorra’s low taxes and are therefore easy on the wallet. Though this does mean that the slopes can get a bit crowded on the weekends, Grandvalira still has more than enough runs for everyone to enjoy. Here is a resort that seems purpose-built to allow skiers of all ages and abilities to enjoy Skiing in the beautiful Andorran mountains. Pas de la Casa-Grau Roig or Pas as it is known here has to be the area’s most popular ski resorts in Andorra when it comes to snowboarding, skiing and après ski activities. A full 100km of skiable area is offered by the connection to Grau Roig. The area is also dotted with links to the slopes and lifts of neighboring Soldeu. The snow cover at Pas is at its best during the month of February and the resort’s 31 lifts will make it easy for you to get to the perfect slope for your ability. While there are a few of the ‘Motorway’ type slopes that head towards the middle of the resort, there is also a wide array of blue runs, red runs as well as slopestyle course whith its very own chairlift. The après ski at Pas is one of the main draws of visiting skiers who will delight in the amount of bars and restaurants available. Most of these bars will have something to cater for every mood as from around four pm the buzz of DJs and Karaoke or live music and sports played on big screens will fill the après ski atmosphere. There are also a few nightclubs that offer themed nights and parties for various ages and clientele. The nightlife available here at Pas is known for its wild nature and the pub-crawl is somewhat of a legend in itself. This means that while the younger skier between the ages of 18 and 25 might find it a great place to enjoy a fun packed holiday on and off the slopes, the same might not be said for a family or more ski-orientated traveller. It is the duty-free shopping that rivals even the Skiing as an attraction in Pas de la Casa. Pas de la Casa ski resort is filled with supermarkets that sell only cigarettes or alcohol to cater for your every duty-free need. You can also visit one of the many boutiques or larger department stores which stock everything else you could need from perfumes to designer watches and all in between. Pas de la Casa-Greu Roig is one of the better equipped ski areas in the region and with the connections that it shares with Soldeu it is only becoming more popular so visit before it becomes too well-known and while you can still enjoy one of the wonders of the Andorran peaks. El Tarter and Soldeu are able to offer skiers what has to be one of the best ranges of everything you want from an Andorran skiing holiday. Whether it is the reasonably priced accommodation, the nightlife, the atmosphere or the views, you can get it all at one of the older ski-resorts in Andorra. Praised by families - as a great place to take the kids skiing, this area has built a reputation of being able to cope with the wide needs of all members of the family. British families flock here for the teaching as most of the nearly two hundred instructors here speak English. With nearly thirty lifts there are excellent connections to all parts of this amazing ski-area. Soldeu has long been considered as the best resort for an ‘all-round’ ski holiday experience and with the excellently linked slopes and one of the world’s top rated ski-schools it is easy to see why. Well in terms of skiing at least they have it covered. When not enjoying the slopes however you can delight in the world famous ‘Sport Wellness Spa’. This amazingly well-equipped facility is home to a large swimming pool, Jacuzzis both inside and outside, a fully kitted out gymnasium as well as saunas and steam rooms. You can even pamper yourself or treat a loved one to a massage or one of the other beauty treatments on offer there. These two skiable areas and all that they have on offer make up a large part of the Grandvalira ski resort and are what help make Grandvalira one of the most popular resorts in the region. Vallnord is considered as the other super-resort in the Andorran mountain range. This huge area is basically comprised of the skiable areas of Arcalis, Arinsal also those of Pal. This means that there are three separate areas to enjoy within the one resort and more importantly all three can be accessed using a Vallnord ski-pass. Vallnord is considered the more affordable of the two Andorran ski areas. The interesting thing about this huge resort which joins two separate ski areas is that while all facilities and skiable areas are shared, the two separate areas manage to maintain their own character and atmosphere. This makes it far easier for the resort to cater for skiers who want different things from a ski holiday. Vallnord was at the 2017 World Ski Awards crowned Andorra’s best ski resort and when you take a look at what is on offer at either of the two ski areas that make it up, it is not hard to see why. Having won the prizes for best Resort, Hotel, Chalet and Boutique Hotel, Vallnord has firmly placed itself at the top of the list for Andorran skiing experiences. Not too many people will have heard of Arcalis. Even those who have visited Andorra before may not be aware of this small ski resort. The main reason for the wonderfully secretive nature of this resort is its placement within the Andorran peaks. Situated within a remote valley which is surrounded by beautiful mountains, Arcalis is one of few ski areas that are not attached to a village. What this means is that there is less focus on everything else and far more on the skiing. Being that this small resort is somewhat difficult to reach, most of its patrons are Spanish and the atmosphere at Arcalis is truly “Andorran but with a Spanish twist…”. It would seem that not many British or French skiers make it this far into the Andorran landscape. This authenticity is embodied in the Catalan cuisine offered up by La Borda restaurant. Because Arcalis is one of the highest resorts in the Andorran range, it has some of the most reliable snow cover in the area. The resort has 13 ski-lifts and is seen as more of a place to visit for the day as there is no accommodation here and the closest nearby village is 2.5 km away. Claimed by many to be the area’s most exciting ski terrain, Arcalis has slopes for people of all abilities but is regarded as one of the better resorts for those who enjoy challenging terrain. Arcalis joins the excitement of freeride areas and off-piste choices with the joys of long blue and green routes for cruising and fast red runs. There are even some steep black runs on offer here as well. The resort houses a small board park, and nearly thirty separate runs from the groomed slopes to powder drift dotted snow-fields. Due to its remote location the après ski at Arcalis pretty much consists of heading back to your hotel for a calm and relaxing drink. The lack of après ski here cannot however take away from the amazing skiing which is to be had at Arcalis. Arinsal is a ski-resort is situated in the Vallnord ski area. Year after year intermediates and beginners alike flock to Arinsal for its great value for money. It is rare that you will find a ski-resort that is able to offer not only reasonable pricing but also decent nightlife, great accommodation and all the enjoyment on the slopes that you can handle. Arinsal sits just 10km from Andorra’s capital city (Andorra la Vella) which is a great place to stop and check out when you are not on the slopes. The close proximity to the capital city and all the nightlife options available at Arinsal make it a far more popular destination amongst fun loving skiers. Most of those who travel to Arinsal will be doing so for the fun atmosphere and reasonably priced experience. When it comes to the skiing here at Arinsal the resort does not let you down. Collectively comprising of two cable car linked areas (Pal and Arinsal), this resort has some great snow on offer. Most of the skiing here takes place high above the village where the snow levels are more reliable. This does mean that Arinsal is able to offer more than 3000 feet of un-obscured skiing from its highest lift point to the bottom of the slopes. Not many other resorts can claim that. With a large ski park at the high end of the ski area which sits alongside several short red and black runs, the resort seems to centre around a pair of blue runs that swerve from the resorts upper snow bowl right down to the lodges at the resort’s base. The après ski options at Arinsal are one of the largest draws for travellers who come here. Being near to the capital city and having great bus services that can take skiers from the slopes right to the areas famous spas and shopping areas makes Arinsal the perfect destination for those who want more than skiing. And with 4-star hotels like the Princess Parc that are able to offer yet more spas as well as ten pin bowling and an arcade for the younger visitors, there really is something for everyone at Arinsal. Arinsal even caters for those who do not ski. Here you can enjoy dog sledding and snowmobile routes. You can put on some snowshoes and go for a trek. You can ride in a helicopter over the peaks or enjoy the laser version of paintballing that is on offer at the purpose built ‘Laser-combat battlefield’. After a day of fun whether on or off the slopes you can make the most of Arinsal’s welcoming and warm bars which for the most part stay open until the early hours. So when you find yourself planning that next ski-holiday, do not forget the world of skiing as well as après ski offerings that are available in this hidden gem amongst the Pyrenees; Andorra.